A fresh new year and new beginnings: Armed with my trusty post-it-notes and a moleskin I started plotting and planning for the year ahead. I have noticed that when I am not organised that our blog can quickly become a whole lot more than something that occurs in the background of family life. As I figured out regular blog posts and weekly plans I began to realise that their were quite a few parallels between blogging and family life. Not to mention all those post-it-notes were crying out for little folk to help me!!! 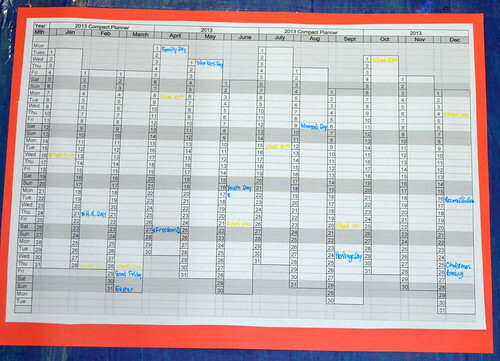 A Year at A Glance: This calendar is where we plot national holidays, school vacations, birthdays and so on. Critical appointments that can be booked months in advance – you know how easy it is to forget those. 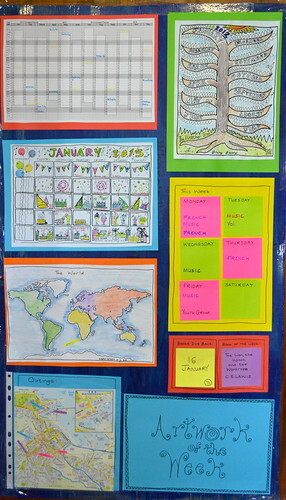 A Quick google search for a printable yearly calendar produced heaps of potential calendars. Follow the link to find the one we used. A Month at a Glance: This is our monthly calendar in action… you can see the days that we will definitely be celebrating this month. 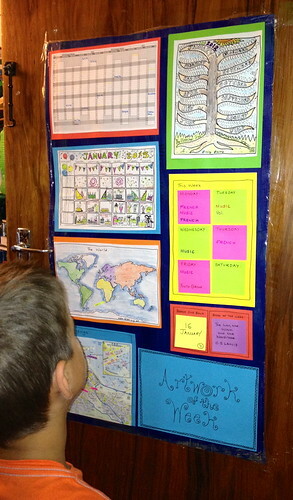 A Weekly Calendar: As my kids get older and have their own agendas and extra-murals… it is essential that we have one central place where I can glance at the events of each week and remind our kids of their extra-mural of the day. 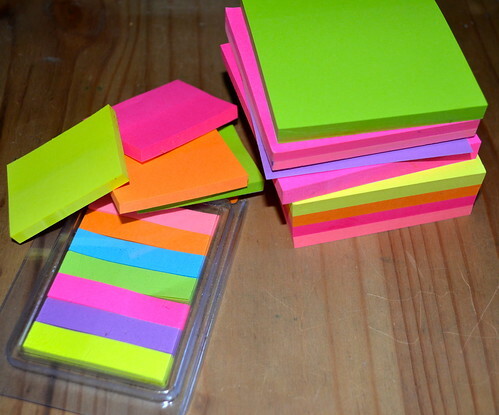 But you know kids and schedules… as soon as you have everything sorted then they change… so these are post-it-notes. Easy to swap out and put new information up when things change. My kids are colour coded, so different folks have different colour markers on the board – it just makes life a little easier to know where everyone is at a given time!!! 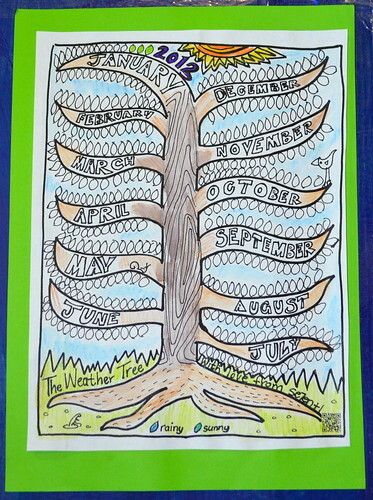 A Weather Tree: This is the task of someone short in our home – year in and year out we have a Printable Weather Tree, a green leaf for a fine day and a blue leaf for a rainy day. If we had more exotic weather we would have more leaves but we live in a rain or shine part of the world!!! 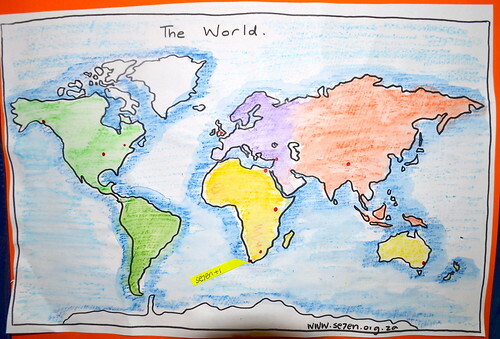 A World Map: Yes we do track our mail and see where we send our letters to, we keep track of folk that we write to often there as well. Right now, since we have just sent out postcard for our postcard swap… we are desperately keen to see where our mail comes from!!! If you click on this link it will take you to our printable map. 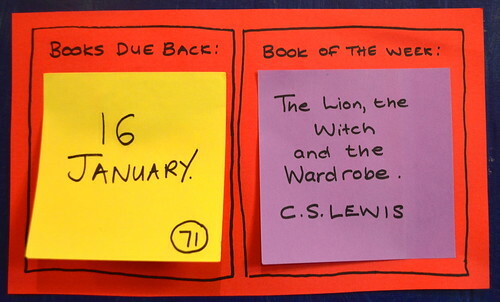 A Book of the Week: We always have a family read aloud on the go and we also need to keep track of when our library books are due and how many books are out… this is vital to our organising… there is no way I am paying library fines on the number of books we take out!!! 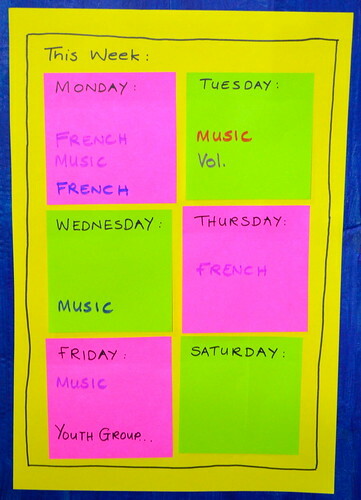 These are also post-it-notes and so they are easy to change out week by week. ArtWork of the Week: My kids art a lot and leave little projects on my keyboard constantly!!! 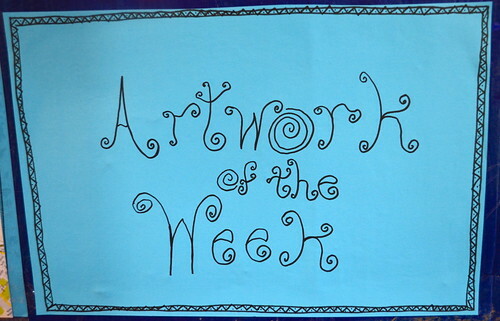 We have an artwork of the week in our home and they take turns to feature!!! 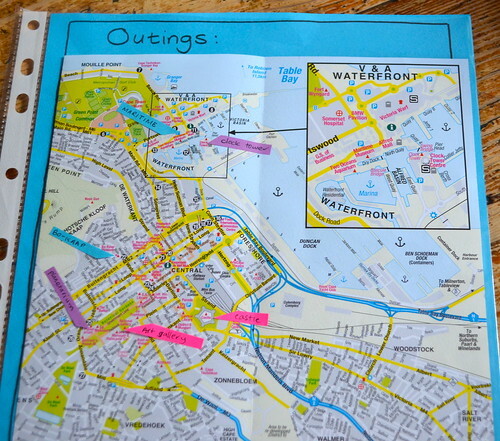 Potential Outings: This is a map of the city, and I am sure you can pick up one for your your hometown… from a tourism centre. I am all for being a tourist in your own town and Cape Town seems to have so many interesting places to visit. We have a couple of outings that we want to do this year. This gives us something to look forward to and also reminds us to explore a little further than on our doorstep!!! That’s it for now – we have made a start on our notice board. It is up and ready for action!!! Hopefully our home will run like a smooth machine this year – and I should probably get back to some blog planning!!! 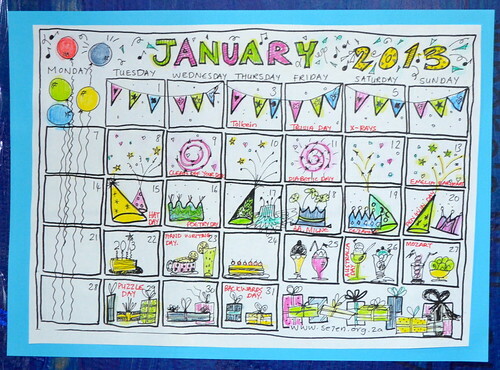 Glad you like it Mel… wishing you and your kids many surprise outings in 2013!!! Have a fabulous weekend!!! Hay Laura W!!! Always lovely to hear from you!!! And of course I should have known you would love post-it-notes!!! I can’t help myself with them, I’m always looking for uses for them!!! Wishing you and your extra special family a fabulous New Year!!! Really awesome. 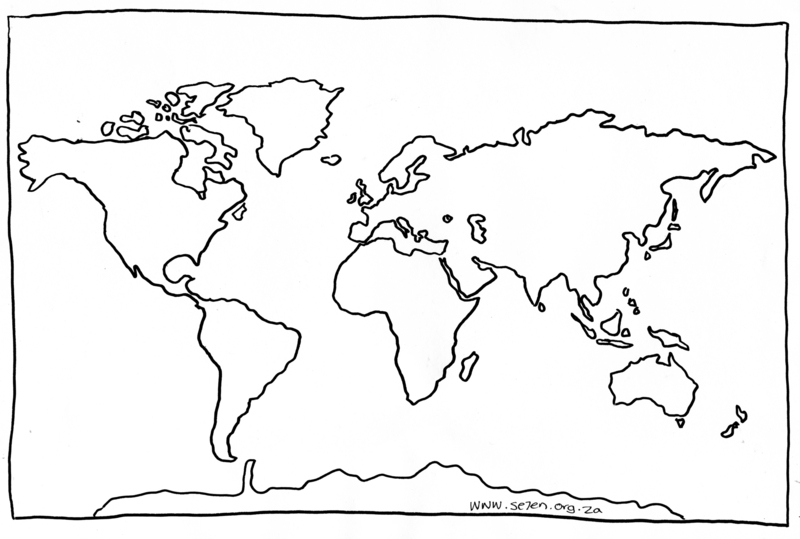 I love the map and the yearplanner most – with that I would feel entirely oriented! Hay Corli, I love that expression “entirely oriented”… I am hoping our noticeboard will help me feel the same, rather than the exact opposite… I really had to figure out who had extra-murals when – my kids all know when they have to be where and pretty much get themselves there… but I needed an idea of when to schedule or not schedule friends and visitors to avoid clashes!!! Lots of lekker love from the far side of the world!! !